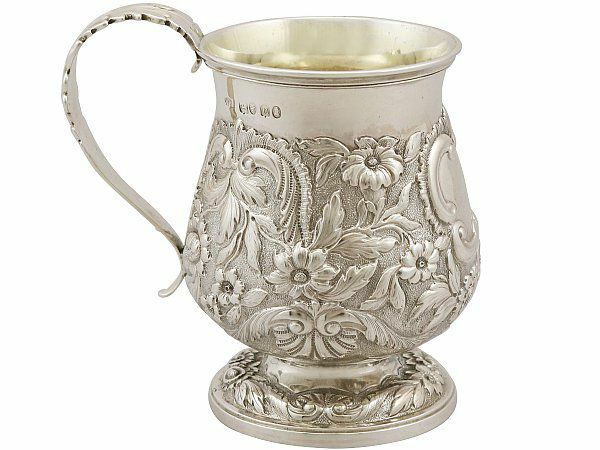 This fine antique George IV sterling silver christening mug has a baluster shaped form to a circular spreading foot. The body and foot of this piece of antique silverware are embellished with embossed and chased floral, foliate and scrolling leaf decoration, all on a matte textured background. The ornamentation to the mug incorporates a scroll bordered cartouche to the anterior surface. This sterling silver christening mug is fitted with a plain C scroll handle ornamented with a cast leaf decorated handpiece accented with a central floral motif. This impressive piece retains the original gilded interior. This antique mug is a very good gauge of silver, fine quality and in excellent presentation condition. Length from back handle to rim 10.6cm/4.1"